Family of man killed in Buffalo police encounter demands "Justice for Jose"
Family members of a man fatally shot by a Buffalo Police officer early last month joined community activists in Niagara Square Wednesday afternoon, demanding answers and justice as the investigation continues. Jose Hernandez-Rossy died May 7 following a confrontation by officers in the city's Black Rock section. Investigators say officer Justin Tedesco shot Hernandez-Rossy after he thought the civilian had shot his partner, Joseph Acquino. Family members of the late Jose Hernandez-Rossy and their supporters walk through Niagara Square Wednesday afternoon, demanding "Justice for Jose." Hernandez-Rossy was shot and killed by a Buffalo Police officer May 7 after the officer reportedly believed that his partner had been shot by the civilian. Acquino suffered a head wound but no gun was ever recovered. A Buffalo News article published shortly after the incident suggests his injuries may instead be related to an air bag that discharged inside Hernandez-Rossy's vehicle during the encounter. 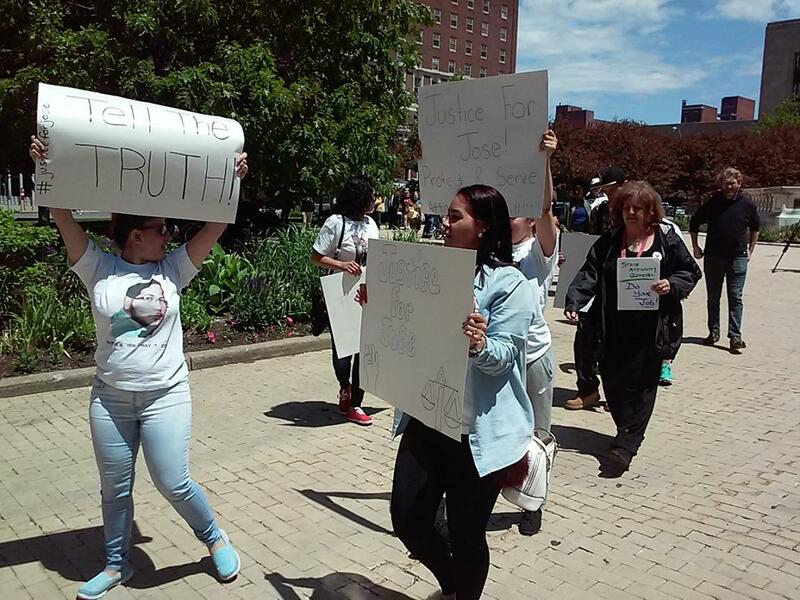 In Niagara Square Wednesday afternoon, family members and community activists walked with signs and wore t-shirts featuring the words "Justice for Jose." "We're looking for answers," said Javier Rossy, Hernandez-Rossy's cousin. "They pulled a gun out. My cousin didn't have no weapons on him, and we're looking for answers. He got into a struggle. He ran away in fear for his life. That's how we feel and we want to know what happened." The State Attorney General's Office is now investigating. Nelson Torre, the attorney representing Hernandez-Rossy's family, spoke on behalf of the family in Niagara Square and briefly addressed the state investigation. "So far, they're very content that the Attorney General is investigating the case and has promised them, directly and personally, that they will get to the bottom of what happened, based upon the facts and the evidence," Torre said. Attorney Nelson Torre reads a statement on behalf of the family of Jose Hernandez-Rossy in Niagara Square. Because this is now the Attorney General's probe, neither Buffalo Police nor the Erie County District Attorney's Office are commenting further on the case. Last month during a news conference, when he last spoke of the case, District Attorney John Flynn explained that the Attorney General has the power to step in when a death involving a police officer raises questions of whether the deceased was armed and dangerous. Flynn stated then that Acquino, amidst a struggle with Hernandez-Rossy inside the latter's vehicle, truly believed he had been shot and that Buffalo Police at that time had no reason to believe otherwise. "A gunshot and the air bag going off are two totally different sounds," Rossy said. "There's no answers yet. Everything is trying to be swept under the rug, as far as I know." Torre recently revealed that his own investigation don on behalf of the family concluded their loved one was a homicide victim. He was asked if any witnesses had come forward with evidence, perhaps video recorded on smartphones. "We've released what evidence we're in a position to release at this time, at least what we can about the investigation to date," Torre said. "I wish I could tell you more but we want to be respectful of the Attorney General's investigation and let that conclude itself." 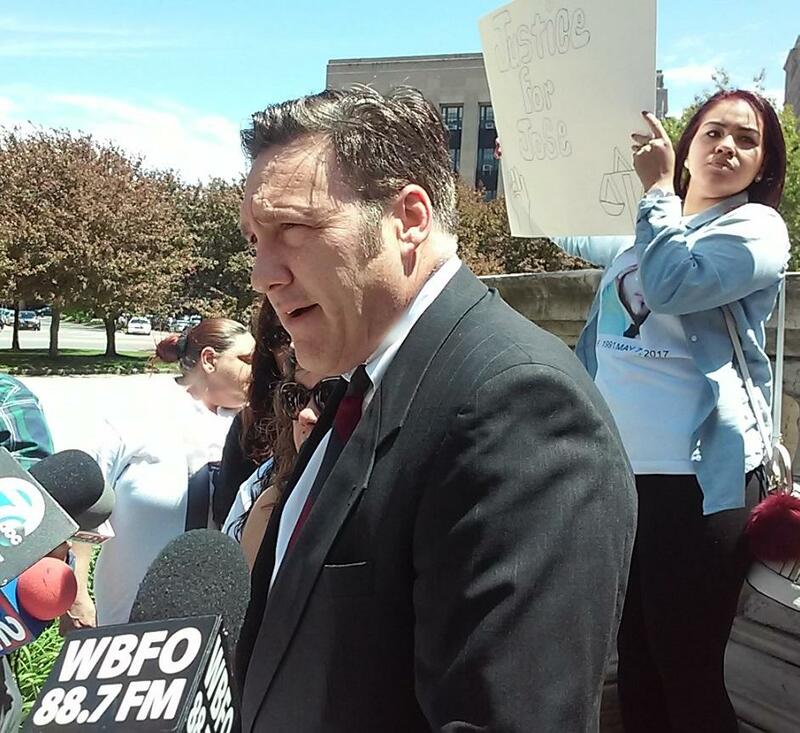 Attorney Nelson Torre reads a statement on behalf of the family of Jose Hernandez-Rossy, who was fatally shot by a Buffalo Police officer May 7, in Niagara Square on Wednesday, May 31. The state attorney general has taken over the investigation of a Sunday afternoon incident that left a suspect dead and a Buffalo Police officer wounded. Moving forward, Erie County District Attorney John Flynn is no longer commenting on the continuing investigation of a civilian's shooting death by a Buffalo Police officer. Flynn hosted a news conference late Wednesday morning to explain the New York State Attorney General's takeover of the case. A Buffalo Police officer is in “fair” condition and good spirits after he was shot in the head on Sunday evening in the Black Rock-Riverside neighborhood. Last fall, Investigative Post exposed the subpar training Buffalo police receive in the use of force and firearms, the exact kind of training needed to prevent a Ferguson-type tragedy. Those concerns have grown in the wake of the deaths of two men of color, Wardel Davis in February and Jose Hernandez-Rossy last week, after encounters with police.